Zotye Auto Chairman Jin Zheyong and Ford Asia Pacific President and Ford Group Vice President Peter Fleet shake hands after establishing Zotye Ford Smart Mobility Technology Co., Ltd.
Ford Smart Mobility LLC and Zotye on Thursday announced the signing of a definitive joint venture agreement that establishes Zotye Ford Smart Mobility Technology Co., Ltd. The 50:50 joint venture will focus on the development of all-electric vehicles for ride-hailing in China, with the Zotye Z500EV sedan established as the first offering available for fleet use. The signing took place in Shanghai on Thursday with Ford Asia Pacific President and Ford Group Vice President Peter Fleet and Zotye Auto Chairman Jin Zheyong signing the paperwork proper. Ford Executive Vice President and President of Global Markets Jim Farley and Tech-New Group Ltd. Chairman Ying Jianren were on-hand to witness the proceedings. 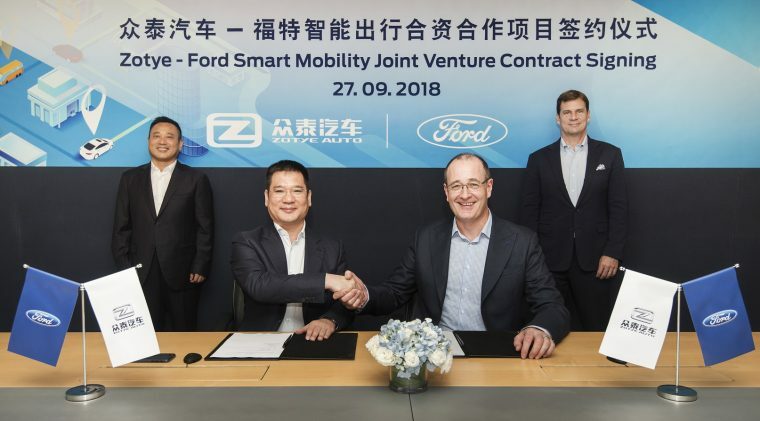 Ford Smart Mobility and Zotye signed a Memorandum of Understanding to establish Zotye Ford Smart Mobility Technology Co., Ltd. In May of this year. In December 2017, Ford and Zotye also established the Zotye Ford Automobile joint venture, with which the new mobility JV will work to create a range of new electric vehicles for China. Zotye Ford Smart Mobility Technology Co., Ltd. will investigate opportunities to utilize the Transportation Mobility Cloud, which itself results from an August MoU between Ford Smart Mobility LLC’s Autonomic and Alibaba’s Alibaba Cloud.